How Important is Dog Dental Care? Brushing dogs teeth is essential to keeping your Weimaraner dog healthy. Just like with people, brushing your dog’s teeth can prevent bad breath, periodontal disease and heart problems related to plaque buildup. When you don’t brush your dog’s teeth, he can end up with diseases of the mouth, in addition to diseases in his major organs—kidneys, liver, heart or brain. In addition, the most common cause of bad dog breath is plaque buildup and periodontal disease. Dental care for dogs is just as important as dental care is for you. Fortunately taking care of your dog’s teeth is easy, and it only takes about a minute of your time! Today, unlike years ago, there are wonderful dog dental products on the market that make caring for your dog’s teeth simple. And they are designed to be interesting and pleasant for your dog to use. 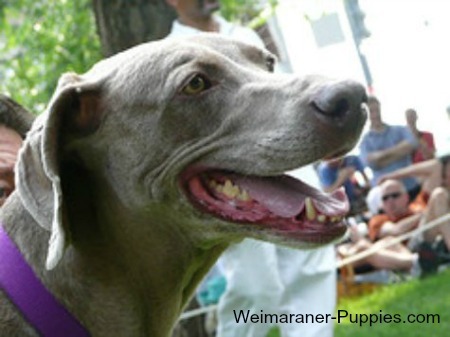 Brushing your Weimaraner dog’s teeth will help keep him healthy. As you may have guessed, Weimaraner puppies are not born with an understanding of how to brush dog teeth, and how important it is. With that in mind, it is important to introduce tooth brushing early, while your dog is still a puppy, and you can do this in small steps. 1. Just as you would do for grooming, you need to handle your puppy frequently. In this case, you’ll want to first get your puppy used to having her mouth touched. Spend about a minute a day lifting her lips and rubbing your fingers gently around her teeth. Keep it fun, and pile on the praise, so that your puppy sees this as a positive experience. 2. After about a week of doing this, bring out the dog toothbrush. Add just a little bit of dog toothpaste and let your puppy lick the toothbrush. Do this until you are sure that your puppy is comfortable with the toothbrush. 3. Next, start brushing your dog’s front teeth, with a downward motion. Use gentle, circular motions and slowly increase the number of teeth that you are brushing each day. Do this until you are brushing all her teeth. The whole process should take only a minute. Make sure you continue to praise your dog each time her teeth are brushed. Soon brushing your dog’s teeth will be routine for you and your dog! Dog Dental Products Make Brushing Dogs’ Teeth Easy! As I mentioned above, there are wonderful new dog dental care products on the market. You should not use human toothbrushes or toothpaste on your dog. Toothpaste for people contains a fluoride (toxic to dogs) and it can also contain sodium or detergents. It should be spit out, to be safe. And dogs simply can’t spit! In addition, a human toothbrush is not designed for a dog’s mouth. • A dog toothbrush – which ideally has an angled head and very soft bristles is made to fit into a dog’s mouth and brush at the angle best for cleaning. • A dog finger toothbrush or glove – Some people find this easier to use. This dog toothbrush slips onto the end of your finger or it can be part of a glove. Use it to clean dog teeth and to stimulate your dog’s gums. • Dog Toothpaste – does not have harmful additives and comes in flavors appealing to dogs. Toothpaste for humans not only has harmful additives, but it will also make your dog’s stomach upset. It’s important to remember that dogs eat their toothpaste! • Dog Dental Bones – can be used to exercise gums and teeth and reduce tartar buildup. While dog dental treats will not totally prevent tartar accumulation, they will routinely knock off some of the built up calculus or plaque, as long as your dog chews his treats. • Brush your dog’s teeth when he is most relaxed, so you won’t have a hard time restraining him. Sit with your dog, in a comfortable position for both of you. • Talk to your dog while brushing, and praise him, to make him feel at ease with the process. Brushing dogs teeth should be fun for both of you. • Lift your dog’s upper lips and start brushing his teeth and gums as gently as you can. Do this in a circular motion for at least ten to fifteen seconds. Use the same kind of motion that you use, when brushing your own teeth. You can use a finger toothbrush or a dog toothbrush for this. Make sure you use dog toothpaste. It’s important to be patient with your dog, and you can increase the area brushed a little each day. You don’t have to brush all his teeth, the first time you do this. If your dog becomes fussy, end the session immediately. Do not overwhelm him with the activity. Remember that this should be a fun activity for the both of you. How Often Should You Brush Dogs’ Teeth? Veterinarians recommend brushing dogs teeth once or twice a day. However, if you are just starting, you can do it once or twice a week, and then increase the frequency when your dog becomes comfortable and at ease with the whole process. In addition to dog tooth brushing, you should also have your dog’s teeth checked by the vet at least once a year. It’s easy to do this when your dog receives her annual physical. If your dog has plaque buildup, your vet may recommend a dog dental cleaning. If that is the case, your dog will be put to sleep for a short time, while the vet cleans his teeth. Brushing dogs teeth can not only improve your dog’s teeth and gums, but it can actually help him become a happier and livelier dog. Dental care for dogs is an important part of keeping your dog healthy. Serious health problems may result from lack of attention to your dog’s dental health. If you are genuinely concerned with your dog, you will do the best that you can to help him lead a healthy and happy life. Start by brushing dogs teeth now. Have you found an easy way to trim your dog’s nails? Consider a hypoallergenic dog shampoo if your dog has irritated skin. 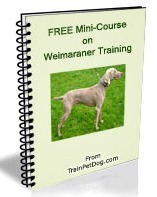 Learn more about Weimaraner care.